Welcome to my French Feves Collection! 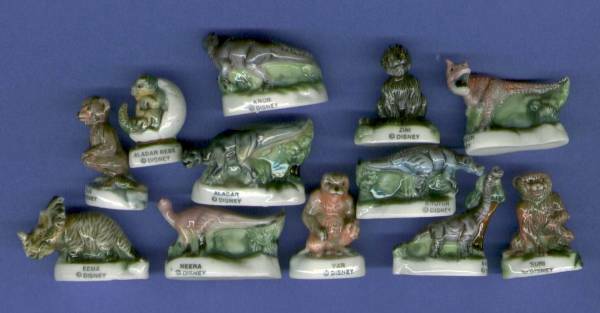 Feves are very unusual, miniature porcelain solid cast (not hollow), mine are 1 1/2 inches and under tall, hand painted with nice color detailing, and especially made for the Epiphany French Tradition Celebration on Jan 6th. Once a year cakes are baked and a Feve, the new modern term, also called a bean and is baked into a special cake, King Cake. The one ending with the piece of cake with the bean baked in is King, Queen ? or just special. The Sets I have are very hard to come by. If you want to trade sets that I don‘t have, Please Yes!!! and email me. I would love more Feves Sets. I currently have 4 sets Betty Boop not for trade, Simpsons, Lord Of The Rings, and Dino’s. payment: paypal = debit card users, cash, check, or M.O.